Solution : Let the side of the cube is x cm. Solution : Let the three sides of the cuboid is l, b and h.
Hence, volume of the cuboid is 81√3 cm3. Question 3: 4cm of rain has fallen on a square km of land. Assuming that 60% of the raindrops could have been collected and contained in a pool having a 200m x 20m base, by what level would the water level in the pool have increased? Only 60% of water is collected and contained in a box. Let a is the water level which increased. Hence, the water level is increased by 6 m in the container. Solution : When we change shape volume remains constant. Hence, height of the cone is 6cm. Solution : Let the radius of the sphere before change is a cm. Hence, the radius of sphere before change is 5 cm. 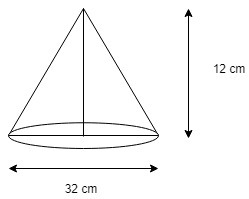 We have to find slant height(l) of the cone. Hence, the cost of painting is Rs 21120. Hence, water level is drop by 10 cm. Question 10:The sum of the radii of two spheres is 20 cm and the sum of their volume is 1760 cm3. What will be the product of their radii? Solution : Let the radii are R and r.
Hence, product of the radii is 379/3. Hence, the height of the cone is 14 cm. Question 12: Balls of the marbles of diameter 1.4 cm diameter are dropped into a cylindrical beaker containing some water and fully submerged. The diameter of the beaker is 14cm. Find how many marbles have been dropped in it if the water rises by 4.9 cm? Hence, 525 marbles are dropped in water. Solution : Let the time taken to fill is a hours. Volume of water transfered through pipe in a hours is equal to Volume of water in the rectangular tank. Hence, time taken is 2 hours. Solution : Let the radius of small spheres is 3a, 4a and 5a. Hence, Radius of largest sphere is 5×1 = 5 cm. Solution : Let the radius of sphere is r.
Let the height of the cylinder is h.